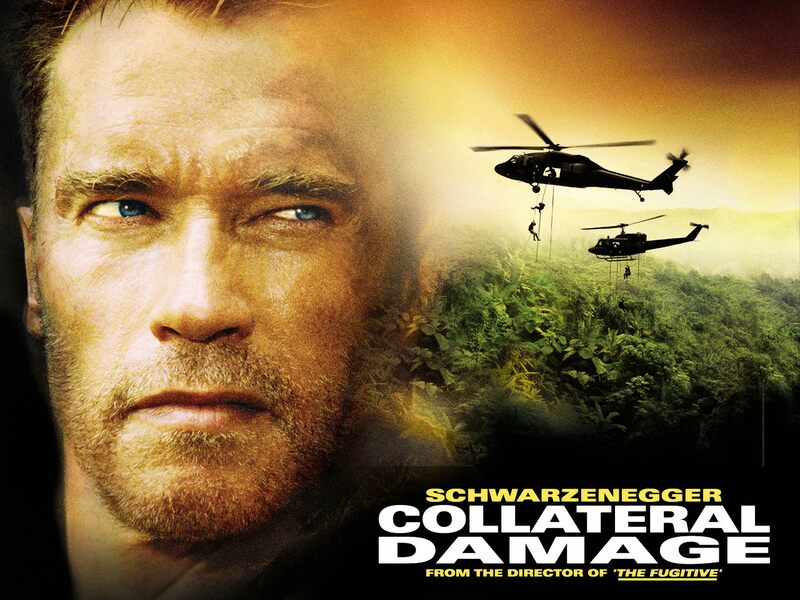 Collateral Damage is a 2002 American action film directed by Andrew Davis, starring Arnold Schwarzenegger, Elias Koteas, Francesca Neri, Cliff Curtis, John Leguizamo and John Turturro. The film was released in the United States on February 8, 2002. The film tells the story of Los Angeles firefighter, Gordon Brewer (Arnold Schwarzenegger), who looks to avenge his son and wife's death at the hands of a guerrilla commando, by traveling to Colombia and facing his family's killers. The original script for the film had the same plotline but would have addressed American policy in the Middle East by taking place in Libya; director Davis and his screenwriters chose Colombia as the new location because that hadn't been used as extensively and touched on a current geopolitical conflict area. Noted anti-war activist Stan Goff was hired as a consultant but later described the film as horrible and stated that taking on the job was the worst mistake he'd ever made. A bomb is detonated in the plaza of the Colombian Consulate building in Los Angeles, killing nine people, including a caravan of Colombian officials and American intelligence agents. Among the civilians killed are the wife and son of LAFD firefighter, Captain Gordon "Gordy" Brewer (Arnold Schwarzenegger), who was injured in the explosion as he arrived to pick up his family. Soon afterward, a tape is sent to the U.S. State Department, in which a masked man calling himself "El Lobo" (The Wolf) claims responsibility for the bombing, explaining it was in retaliation for America's oppression of Colombia. The FBI believes El Lobo is a Colombian terrorist named Claudio Perrini (Cliff Curtis). CIA Special Agent Peter Brandt (Elias Koteas), the Colombia Station Chief, is harshly reprimanded for the incident by a Senate Oversight Committee, who promptly terminate all CIA operations in Colombia. Brandt angrily returns to Mompós and meets with his paramilitary allies to plan a major offensive to take down Claudio and his guerilla forces. Frustrated at the political red tape regarding the investigation, Brewer also travels to Mompós to personally hunt down Claudio, but is quickly arrested for illegally entering the country. The guerillas stage a prison break to free their fellow members as well as try and abduct Brewer to demand a large ransom for him. Brandt's unit is alerted to Brewer's presence in Colombia, but arrive too late to prevent the prison break. Brewer escapes the prison, avoids being captured, and secures a guerilla zone pass from Canadian mechanic Sean Armstrong (John Turturro) who reveals information into setting him up with drug runner, Felix Ramirez (John Leguizamo), the manager of the cocaine distribution facility that finances the guerrillas. Pretending to be a mechanic hired to fix a generator, Brewer rigs several improvised explosives and destroys the facility. Felix is blamed for the destruction of the drug plant and is executed in front of a hiding Brewer's eyes. Brewer then infiltrates Claudio's headquarters and plants a bomb to kill him, but is captured when he tries to prevent a woman named Selena (Francesca Neri) from being caught in the blast radius along with her son, Mauro. At Claudio's home compound, Selena reveals that she is Claudio's wife and that she and Claudio once lost their own child during an attack by American forces, which compelled Claudio to become a terrorist and fight back, while Selena found and adopted Mauro, whose parents were killed in the attack. Nevertheless, Selena sympathizes with Brewer and admits that Claudio is planning another bombing in Washington, D.C.. Meanwhile, Brandt's unit locates Claudio's compound and launches an attack. During the ensuing shootout, Selena helps free Brewer and, along with Brandt, travels back to the State Department in Washington, D.C. to help the search effort for Claudio. Selena identifies Union Station as the target, and the FBI go to investigate. On the pretense of using the lavatory, Selena excuses herself from the command room and becomes irritated when Mauro refuses to come with her. Brewer recognizes Selena make the same gesture as the masked man claiming to be El Lobo made in the tape, and realizes that she was the Wolf all along, with Claudio serving as her figurehead. Furthermore, Brewer surmises the real target is the State Department. Brewer quickly throws Mauro's toy dinosaur, which is carrying a bomb, out a window moments before it explodes. Brandt, realizing Brewer's suspicions, is shot and killed trying to stop Selena from fleeing the building. Brewer chases Selena to the basement of the building where she and Claudio ride off through the underground tunnels on a motorcycle. Brewer finds the tunnel control console and shuts the gates, preventing their escape. Brewer chops open some gas lines along the walls of the tunnel and, as they ride back, Selena shoots at Brewer, igniting the gas. Brewer jumps through a doorway just as the entire tunnel explodes. Selena and Claudio survive the blast, however, and attack him simultaneously. After a short, hand to hand fight, Selena is electrocuted by being tossed on the exposed circuitry of the control panel, and Claudio is finally killed when Brewer throws an axe into his chest. In the aftermath, Brewer carries Mauro in his arms as they leave the State Department. A newscast voiceover explains that Brewer will receive the Presidential Medal of Freedom for preventing one of the worst terrorist attacks in U.S. history from taking place.